We got our boat in the water right on time this year, in early May. But the weather wasn’t acting like spring. It was rainy and cold a lot. Tom didn’t care. He’d go sit on the boat in the rain. He says, “It’s a boat. It’s waterproof!” That’s not for me. I stayed home while Tom went and sat on the boat in the lousy weather. Now it’s feeling like summer and I’m getting into the rhythm of boating. Some days we just go to the marina for a few hours, often without the dogs. But when there are several nice days back to back, we pack up the dogs and move to the boat. It’s like going to a floating beach house. Living on the boat feels like a vacation. We’re only a half hour away from home. So in some ways, it makes no sense that we feel like it’s such a big and positive change from our everyday life. But there’s something cozy and fun about living in a mini house. 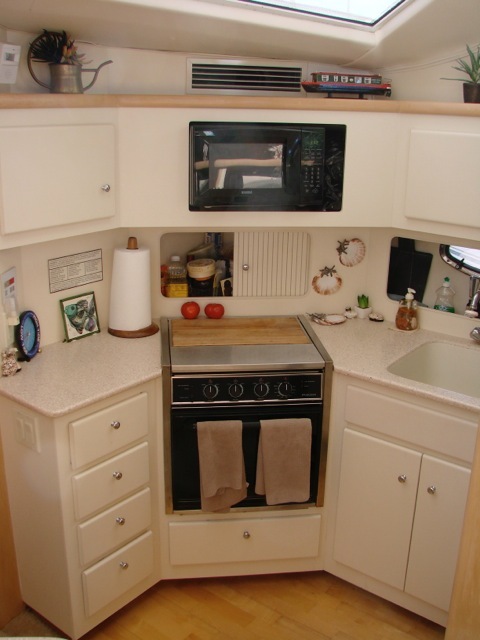 The small kitchen and bathroom are challenges – but fun challenges. Cooking on the small three burner stove often has to be done in installments because I can’t fit three pots on the stove at once. I can’t boil pasta, make sauce and cook meatballs at the same time as I do at home. Creative juggling gets the job done – eventually. We grill a lot at home. But we aren’t allowed to use a grill on our boats at the marina. 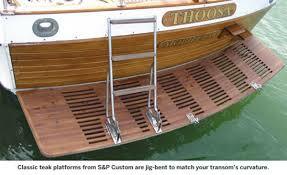 Instead, there’s a communal grill for each dock. You often have to wait your turn to get to it, so we don’t rely on grilling too much on the boat. We tend to order out or go out to eat more. It’s part of the sense of being on vacation when you don’t have to cook as much as you do at home. 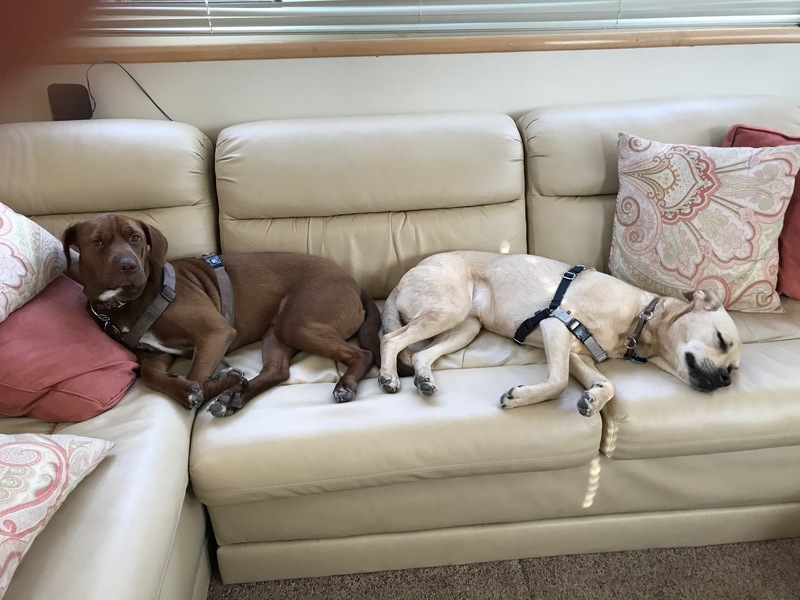 Since we are all living in a smaller space on the boat, we end up spending more time together with the dogs than at home. At home, the dogs spend a lot of time outside in good weather. And they love to go from room to room, sofa to sofa. On the boat, there’s only one sofa for them to crash on. And that’s where I spend most of my time. While we do similar things on the water that we do at home, such as reading and writing, it feels different on the water. Among other things, the dock is a more social environment than in our rather isolated house in the woods. When boats go out or come in, everyone rushes to help. It’s dock etiquette. There is a very strong current in the river at the marina, so getting in and out of our slips can be a tricky affair. After helping a boat in or out, the people on the dock hang out and chat. The same thing happens when we walk the dogs. We end up chatting with people on their boats as we traverse the dock to get the dogs to the parking lot and the dog walking area. Then there are the invitations for drinks and the time spent relaxing on each others’ boats. Most things are impromptu, spur of the moment affairs. You never know who will be on their boats when you’re there. 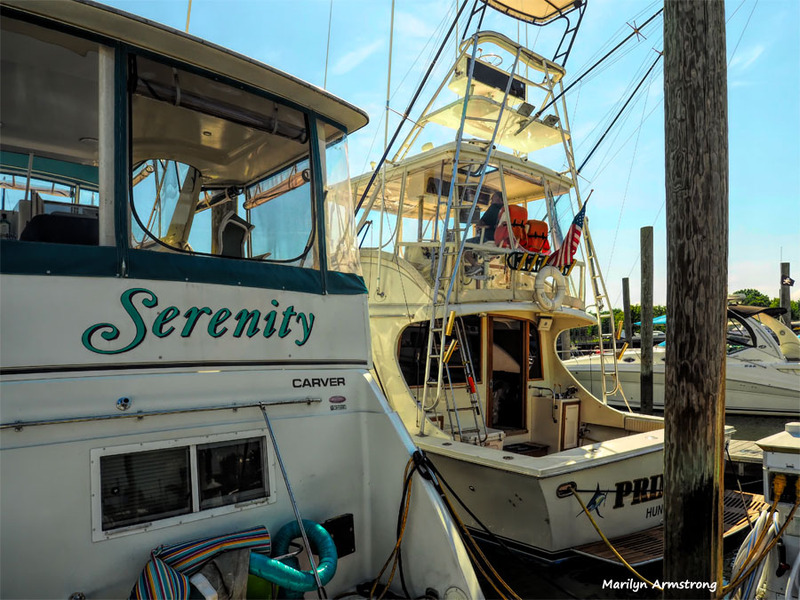 We recently had a wake-up call, reminding us that boat travel can be dangerous. Our good friend took her boat out in bad seas. She got banged around so much, her swim platform literally broke in half and her radar unit broke away from its hinges. If the swim platform had come off ITS hinges, the boat would have started to take on water and sink in the middle of Long Island Sound! She was lucky and dodged a major bullet! My friend was very shaken, as were we. 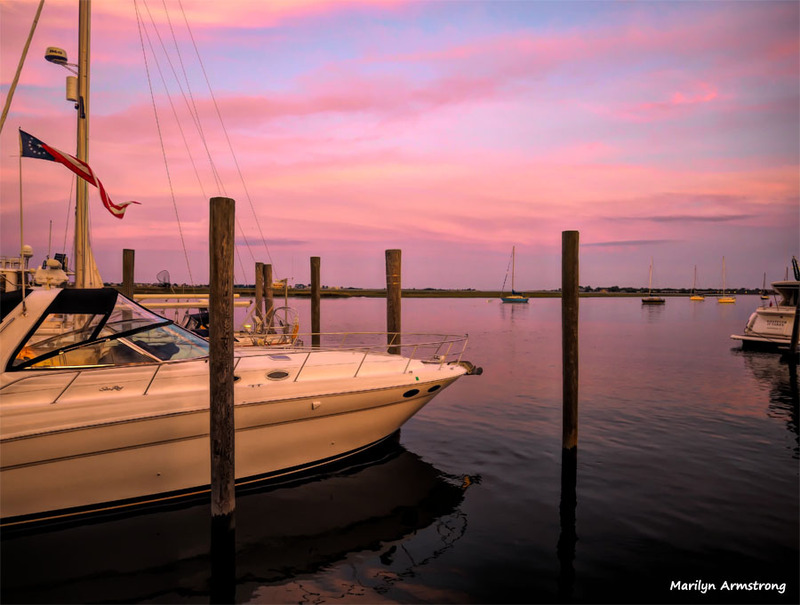 When you are alone out on the water, you are dependent on weather and water conditions. And there can be lots of unpleasant surprises. 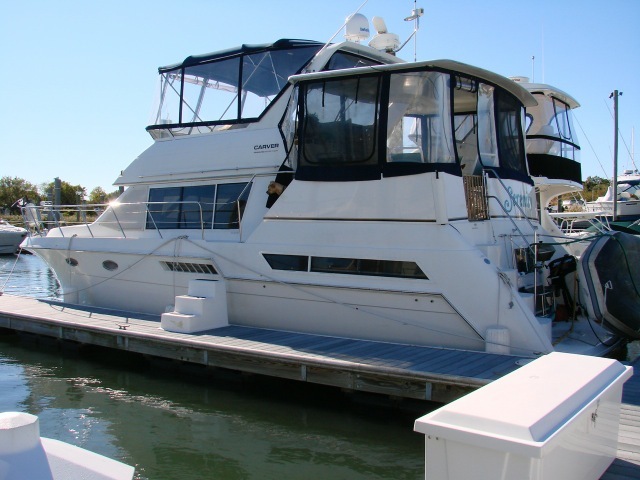 The key to boating safety is knowing when to leave the dock and when to stay put. The go or no-go decision is the most important thing a Captain does. But no matter how careful and conservative you are, you can get caught in unexpected and dicey conditions. 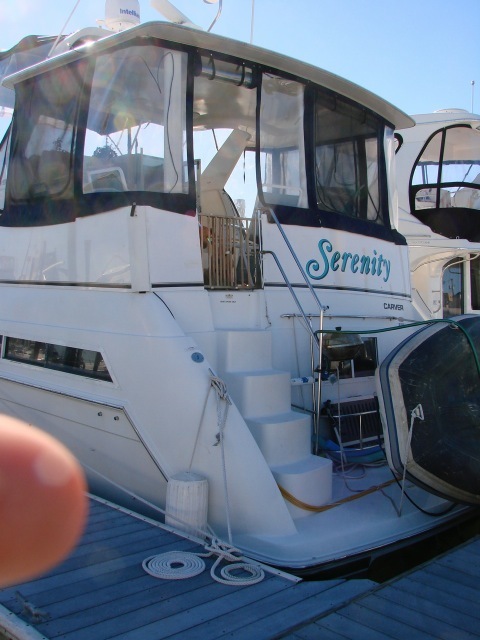 It’s happened to us but we never suffered as much damage to our boat as our friend did. We have had some very rough and scary trips. 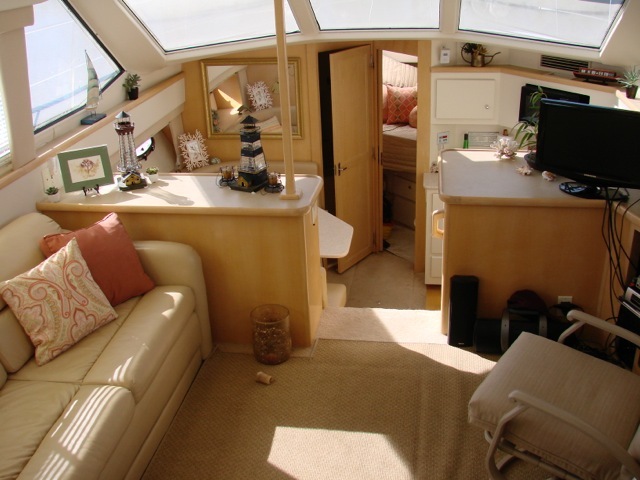 We’ve reached our destination with things flung all over the boat – furniture, contents of drawers, anything not tied down! I’ve had to crawl along the floor to keep a chair from heading off the boat when our gate broke loose! Fortunately, I’m very happy on the dock! I don’t need to go somewhere in my beach house in order to enjoy it. I like hanging out at the marina and taking short day trips. Our friends and family are happy with this routine as well. So this is what we do most of the time. It’s not what all boaters do, but it’s fine for us. Well, WE sure had a great time! And in this heat, I bet you’re really glad for those sea breezes, too. Ditto — what Marilyn said. 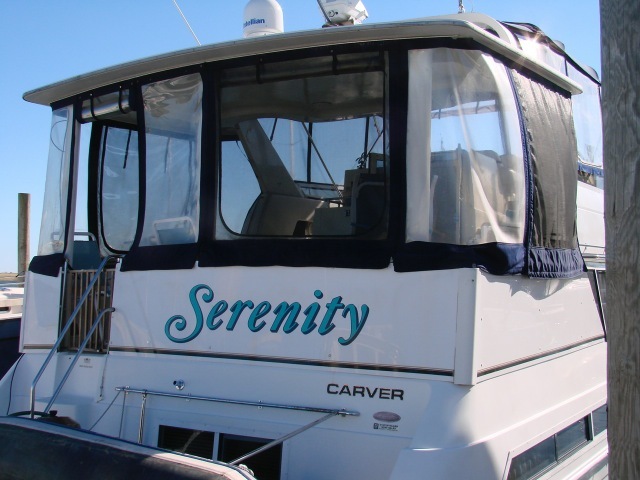 We had an absolutely wonderful time aboard the “Serenity”. Great weather, great friends and treasured time away from the troubles of the world. Thank you! Here’s to a great summer on the water for you – Ellin, Tommy and the furry kids. Thank you, Garry! 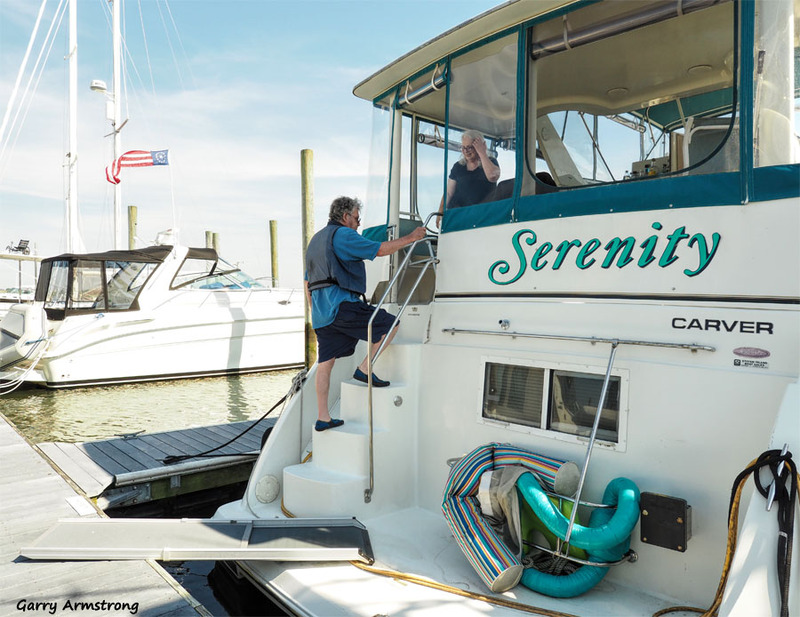 We love having you on the boat and on the shore. You are wonderful and entertaining guests! The sea breeze can only do so much! Thank goodness for the great AC on the boat! 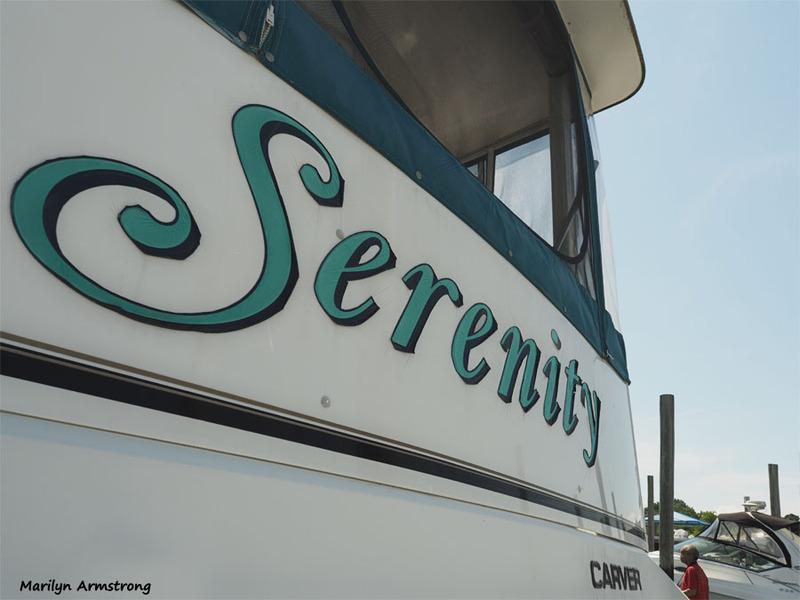 Boating is most relaxing, whether or not you are away from the dock. That’s a gorgeous sunset shot! It was an incredibly beautiful sunset. Tommy “knows people”. 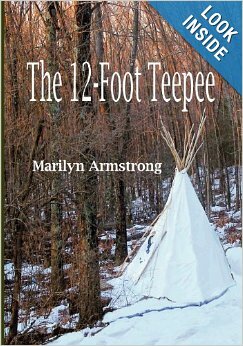 Garry and Marilyn are talented and dedicated photographers. So I’m not surprised when they get wonderful shots. Your’e so right that the most important decision of the captain is “go – no go”. I’ll share two experiences my parents had while boating in the Bahamas. In both instances they got caught in very bad weather. One time they were so far out and the weather was so bad they had to call “mayday’. Fortunately for them, they were on the Air Canada flight path and a plane literally came out of the clouds and directed them to shore. Another time they were out deep sea fishing and the weather turned bad. They were hit by one of those exceptional waves. My mother was thrown up in the air and she landed on her back. She ended up breaking her back and spent several months in a full body cast. As for me I’d probably get sea sick just sitting in dock. Leslie, sorry to hear about those misadventures. 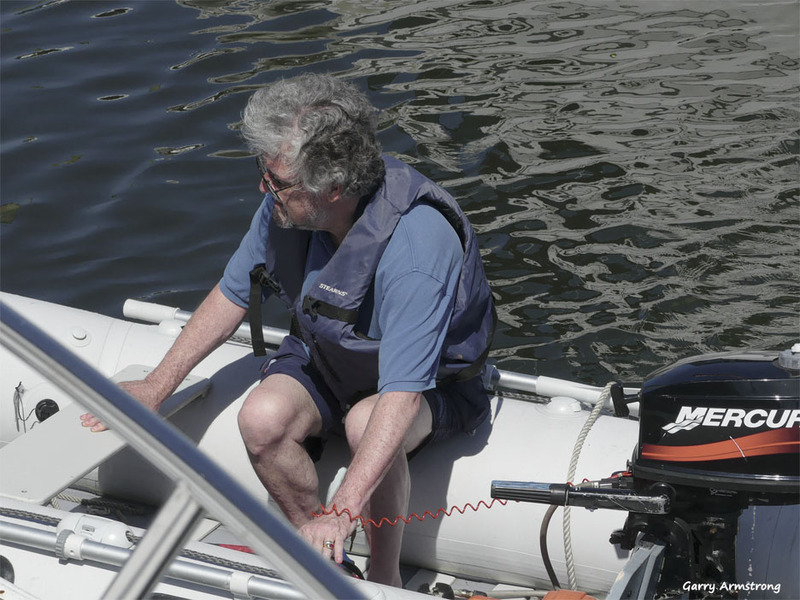 Tommy and Ellin are very careful with their boating activities — especially the safety of their guests. That’s good to hear Garry. You can never tell what’s going to hit you when you’re at sea. Leslie – those are horrific baoting experiences your parents had! Calling mayday must be terrifying. They were lucky to have a plane in the area to help them. And the wave that literally broke your mother’s back! OMG! We are generally wimps and no longer go out when there is any chance of high seas.Sometimes you can’t predict the weather and you get caught off guard anyway. We live in fear of those days! Ellin, they were seniors when this happened and they would have been very careful when they went out, but as you say these things can be very localized and very sudden.